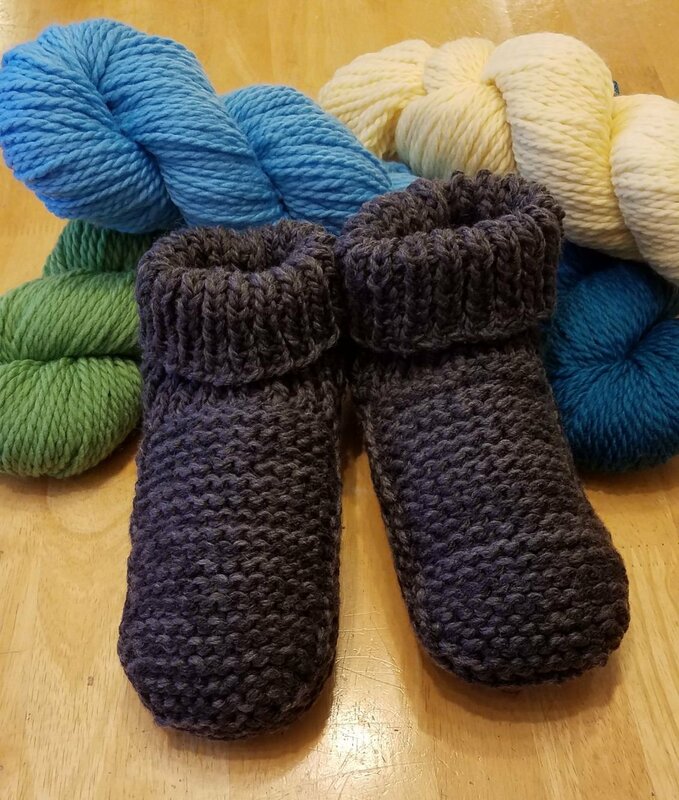 A quick, fun knit, these cozy slippers are sure to become a household favorite. Holding 2 strands together for the foot makes them warm and cushions the sole for extra comfort. Surprisingly stretchy, these slippers will fit a multitude of sizes making them great for gift-giving. Simple enough for a beginner who wants to knit "socks" without having to turn a heel. These slippers are knit flat and seamed. Materials: 2 skeins Cascade 128 Superwash yarn, 1 skein Cascade Pacific yarn, Size 9 (5.5mm) straight or circular needle, Size 10.5 (6.5mm) 24" or longer circular needle, removable stitch marker, stitch markers, darning needle, and OPTIONAL Stitch Holder. Pattern provided in class.